Mathematical structures and modeling . - Omsk: OmSU, 2017. No.4(40), 167 p.
For researchers, post-graduate students and senior students. This article presents a measure of similarity among finite sequences of arbitrary nature elements. The measure uses number and quality of matches between elements at the same positions as similarity criteria with priority to quality of the match. Quality of the match is treated as maximization of matches between adjacent elements. Examples of similarity measure calculations are adduced for a number of match significance weight coefficients in m-adjacent element positions (m-grams matches). Keywords: measure of similarity, finite sequences, m-grams, variations. 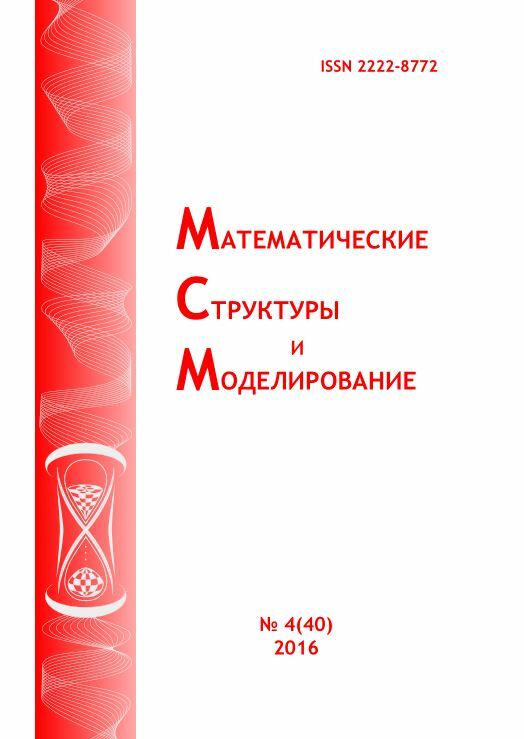 Estimates for the moments and uniform integrability of a certain class of functions of random variables with uniformly strong mixing is obtained in this article. Keywords: symmetric functions of random variables, uniformly strong mixing condition, uniform integrability. Segal’s Chronometric Theory is based on the space-time D which can be represented by a Lie group with a causal structure determined by an invariant Lorentzian form on the Lie algebra u(2). Similarly, the space-time F is represented by a Lie group with a causal structure determined by an invariant Lorentzian form on the Lie algebra u(1, 1). The Lie groups G, GF are introduced as two representations of SU(2, 2) which are conjugate via particular matrix W from Gl(4). Linear-fractional G-action on D is global and conformal; it is instrumental in the analysis of space-time bundles which is based on the parallelizing group U(2). The latter analysis was carried out by Paneitz and Segal in 1980s. Linear-fractional GF-action on F (introduced by Levichev in 2000s) is also conformal. Despite singularities of the latter action, the group U(1, 1) can be chosen as the parallelizing one. In the paper we obtain tables (similar to the ”Paneitz-Segal tables”) which are necessary in order to perform the analysis of space-time bundles based on the parallelizing group U(1, 1). Keywords: parallelizations of space-time bundles, Segal’s cosmos, conformal group SU(2, 2) actions on U(2) and on U(1, 1), DLF-theory. In most applications, practitioners are interested in locating global optima. In such applications, local optima that result from some optimization algorithms are an unnecessary side effect. In other words, in such applications, locating global optima is a much more computationally complex problem than locating local optima. In several practical applications, however, local optima themselves are of interest. Somewhat surprisingly, it turned out that in many such applications, locating all local optima is a much more computationally complex problem than locating all global optima. In this paper, we provide a theoretical explanation for this surprising empirical phenomenon. A recent analysis of the productivity growth data shows, somewhat surprisingly, that the dependence of the 20-century productivity growth on time can be reasonably well described by a Gaussian formula. In this paper, we provide a possible theoretical explanation for this observation. In physics, the number of observed spatial dimensions (three) is usually taken as an empirical fact, without a deep theoretical explanation. In this paper, we provide a possible simple geometric explanation for the 3-D character of the proper space. We also provide a simple geometric explanation for the number of additional spatial dimensions that some physical theories use. Specifically, it is known that for some physical quantities, the 3-D space model with point-wise particles leads to meaningless infinities. To avoid these infinities, physicists have proposed that particles are more adequately described not as 0-D points, but rather as 1-D strings or, more generally, as multi-D ``M-branes''. In the corresponding M-theory, proper space is 10-dimensional. We provide a possible geometric explanation for the 10-D character of the corresponding space. Presented in the paper method, designed to directionally optimize the initial conditions in problems of dynamic systems management, — a method of return — was originally designed to optimize the vector of initial coordinates in a particular model of moving objects conflict whose characteristics deteriorated as a result of interaction with the objects of the opponent and aging. The model was binding characteristics (state vector) and coordinates (control vector) of objects by Lanchester-type differential equations. Then the specific problems of optimal control of the movements of a group of objects, opposing another group of objects with the specified paths in the control interval (by the criterion of minimizing a function of the final states of objects), were set and solved. The problem of the construction of an acceptable on time and accuracy algorithm to optimize the initial control vector, i.e. the initial placement of the group of managed objects, was much more complicated. The found approach has been very general and allows us to directionally optimize the initial control vector, at least in the class of managed smooth systems with continuously differentiable quality functional. In the most general form the idea of the method is that for optimization, in terms of selected quality functional, of the initial conditions of the original optimal control problem the supporting dual problem is written and the iterative process is implemented, which steps alternate original and dual problems, and as part of the initial conditions of the next iteration the part of the final values of the previous iteration is using. Keywords: dynamic systems, optimization of the initial conditions, the inverse problem, the dynamic limits. A quantum approach to description of the Auguste Comte’s ideas on social statics and social dynamics is given. We use the apparatus of quantum cosmology, which allows us to describe the social physics. Keywords: Auguste Comte, social statics, social dynamics, social physics. The problem of estimating the norm of the distance between the two closed smooth curves for pattern recognition is considered. Diffeomorphic transformations of curves based on the model of large deformations are described. For estimating of the norm of the distance between two closed curves the functional, corresponding normalized distance between the two curves, and the equation of diffeomorphic transformations evolution are formed. An algorithm for solving the equation of diffeomorphic transformation is proposed, built on the basis of PSO which can significantly reduce the number of computing operations compared with gradient methods for solving. The developed algorithms can be used in bioinformatics and biometrics systems, classification of images and objects, machine vision systems, for pattern recognition and object tracking systems. Keywords: pattern recognition, invariance, diffeomorphic transformation, biometrics, PSO method. Estimates of the parameters of expert structural model of normal hemodynamics was implemented by numerical methods for nonlinear optimization with conditions. Slight increased agreement between experimental data after physiotherapy and structural model of normal hemodynamic showed lack of physiotherapy efficiency for the normalization of blood pressure regulation. Entropy modeling also showed no reduction in entropy of self-organization and growth of the total entropy of the system after treatment. Detailed analysis revealed a disorganization of correlation between the parameters of normal functional status of the hemodynamics. Keywords: hypertension, structural equations, entropy modeling, correlation analysis. Keywords: analytic hierarchy process, AHP, clustering, taxonomy. The program of the virtual person or chatbot based on an external API, algorithm of search of responses in the knowledge base of expanded markup AIML, as well as the recurrent neural network are developed. The algorithm allows us to find answers to relevant questions from the knowledge base. The procedure of relevant responses sorting includes regular expression search, search by category, search by history and search for the best match of words in questions. The recurrent neural network is defined on the set of words of Q & A knowledge base. Keywords: chatbot, virtual companion, AIML, recurrent neural network. This paper is about private wireless mesh networks. There are definitions and comments for main features of ad hoc networks, survey of public mesh networks and proprietary technologies, routing, modeling and prototyping. Keywords: mesh networks, ad hoc networks, 802.11s, WMN. The article describes the experience of the development and transition to a new information system for reception of entrants to higher education in Omsk State University n.a. F.M. Dostoevskiy. The system is based on the same program, introduced in four Russian universities, it uses old data structure and logic, but has a new web interface. Keywords: information system, development, reception of entrants, applicant, web interface. The article presents one of the possible approaches of formation of electronic educational environment. The problems of educational resources, as well as operational information about the learning process, are considered. Special attention is paid to issues of access control and authentication when requesting access to resources. Keywords: e-learning environment, education, educational process, teaching materials, library, electronic educational resources. The architecture is presented and the mobile client-server application is developed for access from iPhone to the dictionary of the constants of folk speech of the Middle Irtysh area with the necessary set of options. Keywords: application architecture, iOS, mobile app, dictionary of folk speech. In the article we overview how to implement zero knowledge proof authentication protocol in the web. The proposed system consists of two parts: a server side and Android application. Despite the classical password-based approach, users have to install special application and use it as authentication manager. We use QR-codes to send necessary data from the server to the application, so login experience is just scanning this code. Finally, because of zero knowledge proof features the system is resistant to interception, secret-cracking and fishing, so supposed even to use on insecure public devices. Keywords: zero knowledge proof, Web authentication, passwordless. The article deals with object-oriented Harrison-Ruzzo-Ullman access control model and subject-object model with mandatory access control. It is shown that the Bell-LaPadula model and classic mandatory model can be implemented with object-oriented HRU model. Keywords: access control, discretionary security models, mandatory security models, HRU, Bell-LaPadula model.